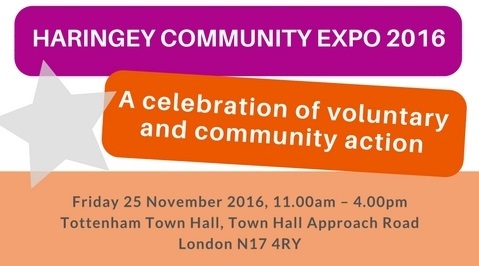 The outstanding work and achievements of Haringey’s community groups and voluntary organisations is to be showcased in the first ever Haringey Voluntary and Community Sector Expo, on Friday 25 November at Tottenham Town Hall. The Bridge Renewal Trust, in partnership with The London Borough of Haringey, is pleased to invite you to this annual public event. Everyone is welcome, including members of the public and partner organisations from the voluntary, public and private sectors. There will be a mix of activities including exhibition stalls, panel discussions and awards to recognise a variety of achievements. The exhibitions will involve displays and stalls in the main hall demonstrating the wide range of community services and activities and visitors can have taster sessions and/or register for them. Health and wellbeing of Haringey’s residents – Expected panel members include Zina Etheridge, Deputy Chief Executive, Haringey Council, Dr Peter Christian, Chair of Haringey Clinical Commissioning Group, Steve Hitchens, Chair – Whittington Health and Sharon Grant, Chair of Public Voice and Haringey Healthwatch. Fundraising and local giving to improve community resilience – Expected panel members include Cllr Eugene Ayisi, Haringey Cabinet Member for Communities, Catherine West, MP for Hornsey and Wood Green, Kristina Glenn, Director of Cripplegate Foundation and Islington Giving and Sona Mahtani, Chief Executive Officer of The Selby Trust. The day will end with a Community Impact Award ceremony, to recognise the outstanding work and achievements of community groups and voluntary organisations that have made a difference to the lives of Haringey residents.